The Middle Tennessee defense showed up in a big way, with two forced turnovers and four forced fumbles (Devin P. Grimes/MTSU Sidelines). 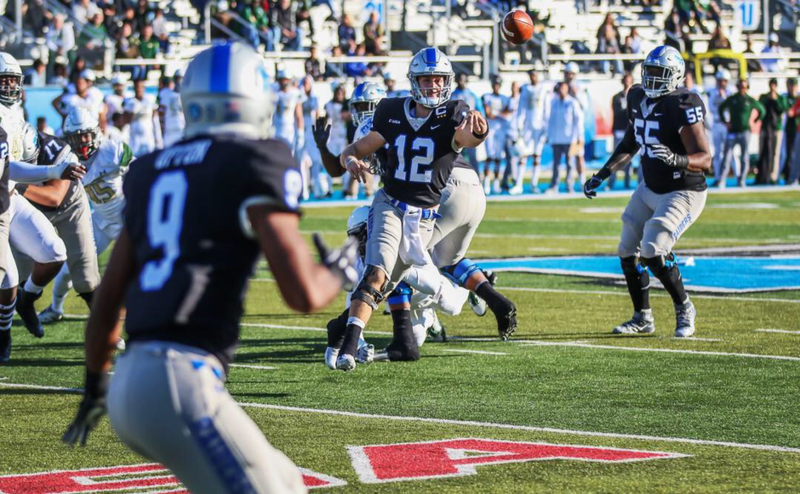 The MTSU Blue Raiders (3-3, 1-1) achieved their first conference victory of the season against the Florida International Panthers (3-2, 2-1) by a score of 37-17 on Saturday. 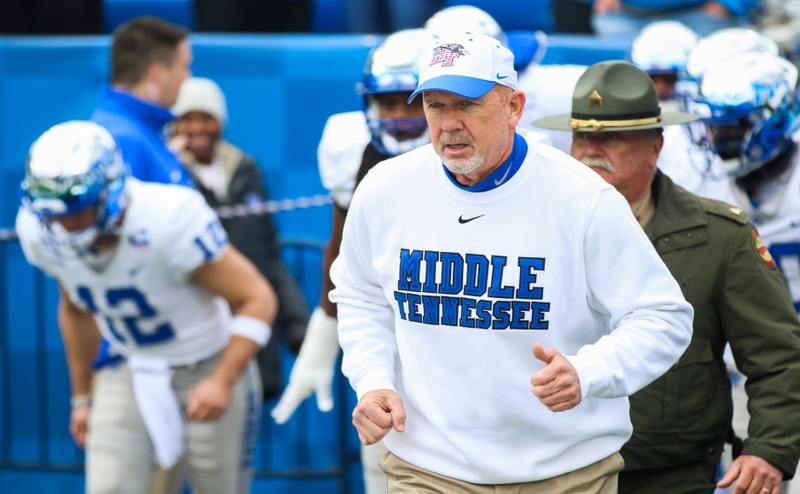 The Blue Raiders welcomed the return of Mike Minter, Walter Brady, Shane Tucker, Isaiah Upton and Terelle West, who added depth to a team that sorely needed it. Middle Tennessee didn’t waste any time putting points on the board as Cannon Rooker connected on a 37-yard field goal to give the Blue Raiders a 3-0 lead after their first drive. Florida International responded on the ensuing drive with a 29-yard Jose Borregales field goal to tie the game at three. 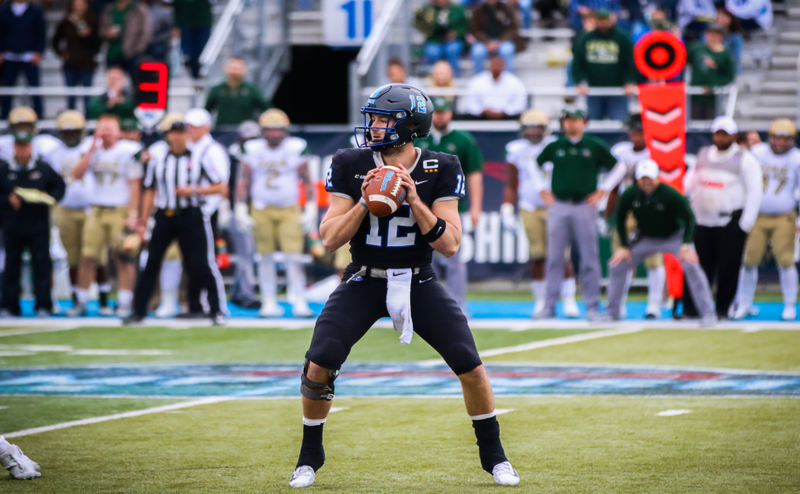 On a drive near the end of the first quarter, MTSU converted on a fourth and three from the FIU 43-yard line to set up a 19-yard touchdown pass from John Urzua to Brad Anderson to make it a 10-3 ballgame. After a Khalil Brooks sack on third down forced an FIU punt, MTSU marched down the field and tacked on another seven points. Linebacker Tavares Thomas came into the ballgame at quarterback to run the wildcat formation and punched it in on a gutsy one-yard carry to give Middle Tennessee a halftime lead of 17-3. Thomas found paydirt again on the Blue Raiders’ first drive out of the locker room, this time from three yards out to give Middle Tennessee a 24-3 lead. 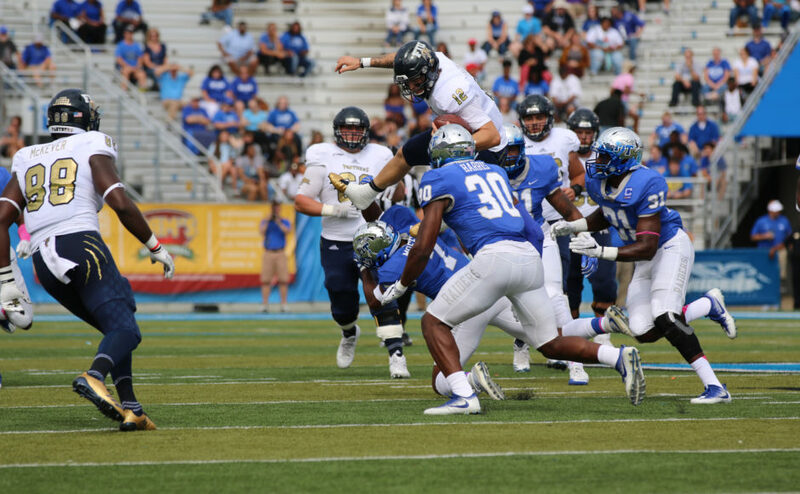 After completing a 46-yard pass to receiver Thomas Owens, FIU quarterback Alex McGough cut into the MTSU lead with a 13-yard touchdown run to make the score 24-10. With 15 seconds remaining in the third quarter, Rooker’s second field goal of the game pushed the Blue Raider lead to 27-10. McGough continued to hook up with Owens, as the receiver’s 10th catch of the day was a four-yard touchdown that cut the MTSU lead to 27-17 with 11:34 left in the game. 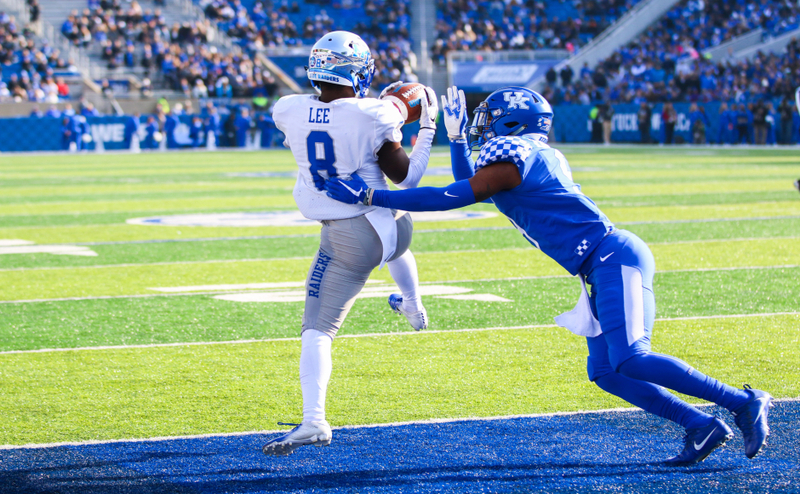 After being set up by a couple Anderson carries, Thomas scored his third touchdown of the game to make it 34-17 in favor of Middle Tennessee. The defense iced the game late, as defensive tackle Jordan Ferguson’s interception led to Rooker’s third field goal of the game to give MTSU a 37-17 advantage. The Blue Raider defense had nine tackles for loss, four forced fumbles and four sacks on the day. John Urzua’s efficiency proved big as he completed 80 percent of his passes in the MTSU victory. At the end of the first quarter, Urzua was 13-14 for 102 yards. On the first play of the second quarter, Urzua found Anderson on a 19-yard wheel route to give MTSU a 10-3 lead. At halftime, Urzua led the Raiders into the locker room with a 14-point lead. He was 16-19 for 134 yards with one touchdown. At the end of the ballgame, Urzua hooked up with Anderson, Ty Lee and Shane Tucker at least four times each on his way to an even 250-yard, one-touchdown performance. Urzua also completed his first career start without throwing an interception, and FIU failed to sack him. Anderson continued to provide the Blue Raiders with production out of the backfield. Aside from his 19-yard touchdown reception, Anderson added another five catches for an additional 28 yards. Anderson also ran for 112 yards on 11 carries, including a 37-yard scamper in the third quarter that set up MTSU’s third touchdown. The Alabama native added a 23-yard carry in the fourth quarter that set up Thomas’ third touchdown run of the day. The 100-yard performance was the second of Anderson’s young career. Khalil Brooks had three tackles for loss in the first half, including a big sack on third down that pushed the Panthers back eight yards to their own 20-yard line. Late in the second quarter, Brooks ended another FIU drive when he came up with a sack to force another FIU punt. Brooks’ five total tackles for loss tied J.K. Sabb’s school record set in 2005. In the fourth quarter, Brooks’ strip sack of McGough gave him his fifth tackle for loss on the day. The Raiders will travel to Birmingham next week to take on the UAB Blazers (2-2, 1-1). Kick-off is at 5:30 p.m.